C:\Documents and Settings\All Users\Application Data\TheBflix (PUP.BFlix) -> Quarantined and deleted successfully. C:\Documents and Settings\Glyn Jones\Desktop\DownloadSetup.exe (Affiliate.Downloader) -> Quarantined and deleted successfully. C:\Documents and Settings\All Users\Application Data\TheBflix\BACKGROUND.HTML (PUP.BFlix) -> Quarantined and deleted successfully. C:\Documents and Settings\All Users\Application Data\TheBflix\content.js (PUP.BFlix) -> Quarantined and deleted successfully. C:\Documents and Settings\All Users\Application Data\TheBflix\ppjemjejnnojomfekgbpbbnecicblllf.crx (PUP.BFlix) -> Quarantined and deleted successfully. I would really appreciate your help on this ..
Is it redirecting when using your browser? Is it opening multiple tabs? Or is just redirecting you from your homepage? Also are you connected to the internet through a router? Let's also have a DDS and aswMBR log. Please post those logs along with the answers to my other questions. Then we will see about getting you cleaned up. 15:30:19.640 Disk 0 MBR has been saved successfully to "C:\Documents and Settings\Glyn Jones\Desktop\MBR.dat"
15:30:19.656 The log file has been saved successfully to "C:\Documents and Settings\Glyn Jones\Desktop\aswMBR.txt"
Windows 5.1.2600 Service Pack 3 Harddisk0\DR0 -> \Device\Ide\IAAStorageDevice-1 Intel___ rev.1.0.
? sprt.sys The system cannot find the file specified. !
? C:\DOCUME~1\GLYNJO~1\LOCALS~1\Temp\mbr.sys The system cannot find the file specified. !
? C:\DOCUME~1\GLYNJO~1\LOCALS~1\Temp\aswMBR.sys The system cannot find the file specified. ! I don't really see anything in your logs. Let's run a couple of tools and see if they find anything. Lets also reset your router. How to reset your Router. AND THE GOOD NEWS IS the re-direct is now gone. Is there anything further you wish me to do? If not, Thank you very much Fireman4it, I certainly appreciate your time and skill. I don't like the looks of this. Lets run Defogger and then run Roguekiller scan again. That looks much better. Let's run MBAM again and An online scanner to make sure nothing is left over. 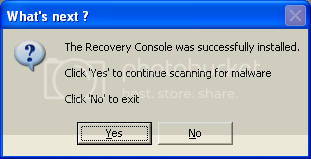 Please update and run a quickscan with MBAM. Everything appears to be running smoothly Fireman4it. Should I clean out my Restore Points and run defogger to re-enable? Or are there other steps needed ... many thanks again!! Last edited by Canuck; 05-02-2012 at 11:01 PM. I've run defogger to re-enable and reset my System Restore. All is running well Thanks for everything! !